My next cruise is coming up at the end of April and I am getting really excited! Like I mentioned in my last cruise post, I'll be going to two new ports on this cruise. Since these will be new ports for me, it only made sense for me to book some fun excursions to get the most out of these stops. ​Keep reading to see which excursions I've chosen for the ports! 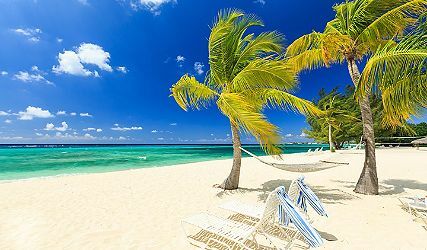 ​For my first excursion, we'll be stopping in George Town, Grand Cayman. I've heard that a lot of people choose to swim with stingrays while they're at this port, so that was definitely at the top of my list. I had also heard there's a turtle farm where you can interact with turtles of all ages and sizes. I was torn between swimming with stingrays or seeing turtles, and then I found an excursion that combines both! Stingray City: Your one-hour interactive visit introduces you to famous stingrays Ray Charles, Sugar Ray and Martha Ray. 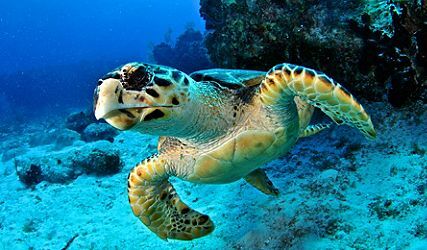 Cayman Turtle Farm: This unique sea center nurtures green and hawk-billed turtles, from newly-hatched to giant elder generations. For our second port, we'll be stopping in Costa Maya, Mexico. This is another port I haven't been to yet, so I knew I also wanted to do an excursion on this day. In all five of my previous cruises, my absolute favorite port days were beach days at Labadee, which is a private island for the cruise ships. Since this next cruise won't be stopping at Labadee, I figured it would be fun to try a beach day at one of the beach options in Costa Maya. Beach Club: Enjoy five hours unwinding along the Mexican Caribbean with complimentary amenities including beach chairs, kayaks and a pool. 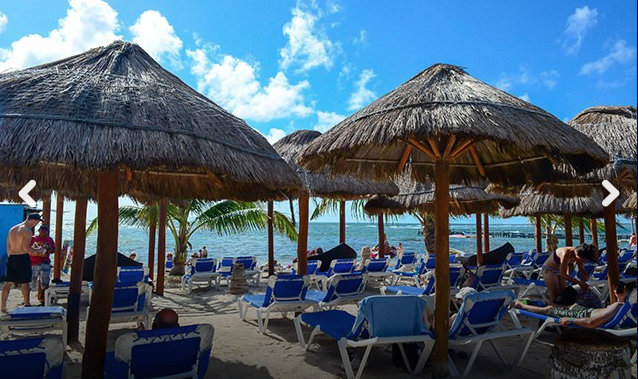 Roundtrip Transportation: Soak in Costa Maya’s seaside splendor as long as you like before being escorted back to port. The third port is Cozumel, which I've been to a few times and just visited in May on my last cruise. This upcoming cruise is only six nights, so we have three ports on back-to-back days, without any sea days in between. Because I've been to Cozumel and it will be our third and final port, I decided not to plan anything that day. I figure I'll be so tired from my busy days at the first two ports that I'll want to chill by the pool while everyone else is off the ship. Those are the excursions I'll be doing on my next cruise. Let me know in the comments if you've been to any of these ports and what your favorite excursions were. If you've been reading this blog for a long time, you might remember a series that I wrote in 2015 called "Something For Yourself". The main point of the series was to give my readers some ideas on how they could bring self-care into their lives. I'm a big believer in doing nice things for yourself and even though the series only lasted a few months, I still had a lot of ideas that I never got around to writing about. So, I've decided to bring back the Something for Yourself series and keep talking about self-care and self-love. Honestly, none of the ideas I'll be sharing are all that revolutionary, but even in their simplicity they are all valuable ways to show yourself some love. For today's post, I wanted to share a new treat that I've been loving lately, detox baths. You've probably already heard about how terrible flu season has been this year and I'm hoping that you've avoided getting sick so far. A few weeks ago I came into contact with someone who ended up having the stomach flu, also known as Noro virus. Within that first 24 hours I didn't necessarily feel sick to my stomach, but I felt really drained and could tell my body was fighting off something. In addition to sleeping on and off all day, I also decided to try taking a detox bath, which I had heard about on Pinterest. I headed to my trusty Health board on Pinterest and looked at a few of the articles I had pinned. Different sites had a variety of options for detox baths, but the main component always seemed to be epsom salt. As you can see, there are plenty of benefits from taking an epsom salt bath. After I took my detox bath, I felt slightly tired and kind of drained, like my body was extra relaxed. By the next morning I felt SO much better and felt completely back in good health, despite my contact with the stomach flu. Part of my recovery could have been all the extra sleep I got, but I also believe the detox bath helped flush the virus out of my system and prevented me from getting full-on sick. 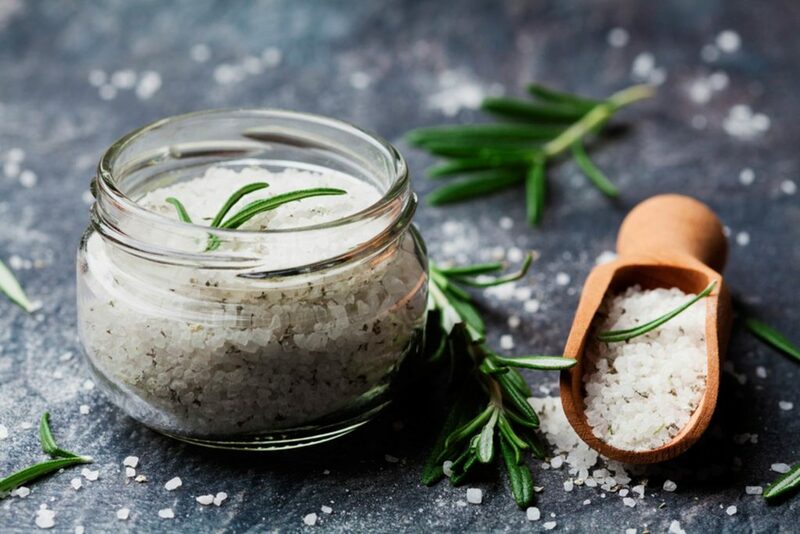 Here are some instructions for taking your own detox bath. You can do this up to 2-3 times a week. I would recommend trying your first couple of baths in the late afternoon or early evening, because you could either feel extra tired, overly alert, or a little of both. I remember laying in bed after my second detox bath and feeling extremely tired and relaxed, but having my mind racing around thinking about how amazing I felt. Begin filling your bathtub with warm to hot water, depending on your preference. Once the water starts to fill up, add your epsom salt to the tub. When adding the baking soda, pour it in right above the water. If you drop it in from further above the water, it tends to puff up into the air and then you'll be breathing it in for a few seconds. Lastly, add the ground ginger. The ginger is optional, but will cause you to sweat and/or tingle as it detoxifies your body. If you're unsure how much to use, add it one tablespoon at a time until you feel sweaty or tingly. That's when you know it's working. Soak in the tub for at least 20 minutes, up to 40 minutes if you can. I usually have an audio book handy or will set up my iPad to watch YouTube videos to pass the time. Once you're done soaking, be sure to rinse off in the shower. Your body has released a lot of toxins and they're now sitting on top of your skin. Also, your pores are wide open right now, so don't wash off with anything containing perfume or dyes to avoid it being absorbed back into your body. Plain old water will do the trick. The ginger is optional, but it is extra effective if you feel sick or feel like you might be fighting off something. Be warned, however, that the ginger leaves a film on your skin and the inside of your bathtub, so be prepared to rinse off your body and the inside of the tub. Some people recommend using filtered water for your detox baths, mostly because they worry about any chemicals found in your tap water. Obviously, using filtered water is only possible if you have a filter for the whole house. Otherwise, be assured that the baking soda will help prevent you from absorbing anything harmful in your water. If you're like me and have an extremely shallow bathtub, I've found an amazing solution that is super handy and super cheap on Amazon! This drain cover is called the Bottomless Bath and is currently listed on Amazon for just $9. I ordered one for myself and I can tell you it worked like a charm! It might have worked a little too well, honestly. I was so excited to have my bath fill up much more than usual that I ran a little too close to the top of the tub. I had to be careful when moving not to splash water over the side. Next time, I'll be sure not to get carried away and will leave a little extra room. Let me know in the comments if you try taking a detox bath! I can't wait to hear if you love them as much as I do!! January is coming to a close and by this time of the year most of our New Year's resolutions have been forgotten. Personally, I didn't even set any resolutions for myself this year. For me, they always feel like things I "should" do because I'm forcing myself into them, not because I want to do them. This year I made it a point to avoid resolutions and just ask myself this question every day: "what would feel good today?" Some days I decide to be lazy or have a low-key day. On those days I might stay in pajamas all day and spend most of my free time reading or watching TV. Other days, I decide that it would feel good to be productive. This might mean getting some cleaning done around my apartment or possibly getting in some type of physical activity. Today, for example, I ended up doing a Zumba workout in my living room using a new DVD I just bought. Even though the workout only lasted for 25 minutes, it was still something, which is always better than nothing. I've noticed that by taking the pressure off myself to workout for 'X number' of days a week, I'm actually enjoying exercise more. I look forward to moving my body, even if it's just some simple squats and lunges or some easy stretching. And even though I have free access to a brand new gym in my apartment clubhouse, I still usually end up working out at home. The last time I went to the gym there were a ton of people there (probably working on those New Year's resolutions) and it felt overwhelming. I walked in the door and felt like every head turned in my direction. Looking back, I know that this was just my imagination simply because I felt self-conscious about being in the gym. It had been weeks since I'd been there and I felt like I was walking into a foreign country where I didn't speak the language. I even tried to do an internal pep talk about how I should be proud of myself for being at the gym, regardless of how out of shape I might be or how much of a newbie I might look like. And I definitely reminded myself that it doesn't matter what other people think of me. Still though, it was a very real moment where I felt unsure of myself and felt self-conscious about whether I "belonged". Thankfully, I'm not alone and I'm sure there are many of you out there who have had the exact same experience. To help, Aaptiv sent me a graphic that I'd like to share with you. 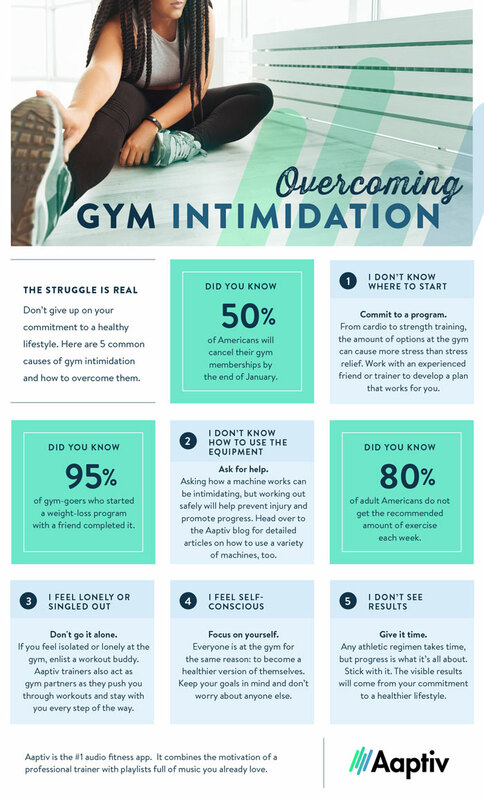 It gives some great advice on ways to overcome gym intimidation. You can also check out their original article here. Let me know what you think in the comments and stay tuned for an upcoming blog post about my new favorite treat: detox baths. My sixth cruise is officially booked and the countdown has already begun! 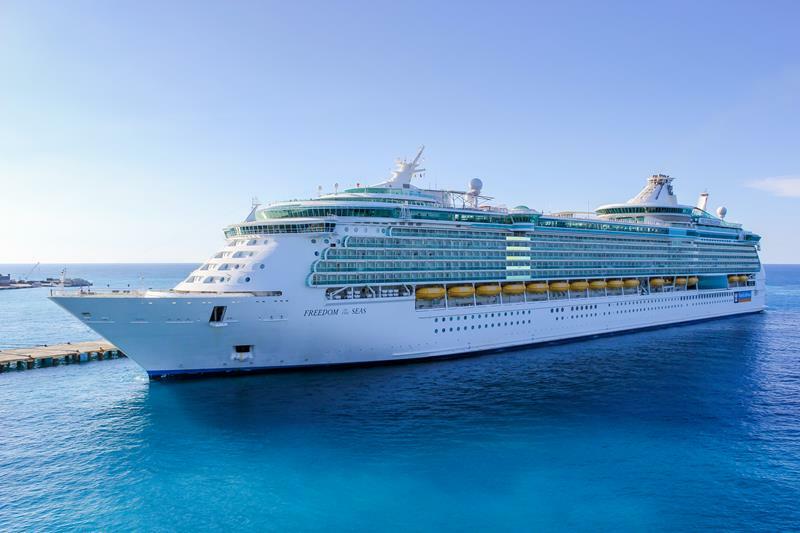 It's been almost a year since my last cruise, so I decided to take a look at Royal Caribbean's website to see if I could find any upcoming cruises that I might want to book. 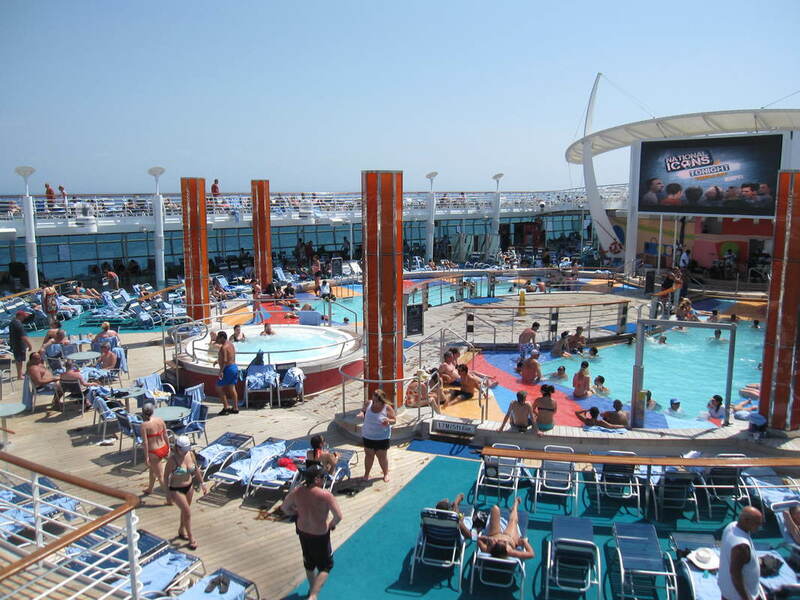 Originally, I was thinking I'd do a cruise later in the year, but I quickly realized that cruising in the summer is a lot more expensive because so many families take their family vacation when the kids are out of school. It ended up making more sense to book a cruise for the end of April, which is when I've sailed on 3 out of 5 cruises so far. Thanks to a very helpful customer service rep at Royal Caribbean, Chris, I was able to find a great deal on a 6-night Western Caribbean cruise. I'll be sailing on Freedom of the Seas, which is a sister ship of the first ship I ever cruised on, Liberty of the Seas. If you'd like to go check out my trip report from that cruise, you can start here. Or, if you'd like to see all cruise related posts, you can click the Cruise category on the right side of this page. Quick side note: I do plan on writing an updated tips & tricks blog post now that I've been on a few more cruises. Please let me know in the comments if you have any questions or if there's anything specific you'd like me to cover. And now, let's get into the details for this next cruise! Like I said, it's a 6-night cruise and it's going to the Western Caribbean. I have been in this area before, but we're actually going to 2 ports I've never visited, so I'm really excited to see some new places! I originally debated flying in the day of the cruise and saving myself the cost of a hotel room the night before, but I've heard too many horror stories of people missing their cruises because of flight delays, so I decided to be safe and come in the night before. The 2 ports I've never been to are Grand Cayman and Costa Maya. I've been wanting to go to Grand Cayman for a long time, so I'm extra excited about that stop. At first I was determined to go on the stingray excursion where you are in waist-high water and the stingrays are swimming all around you. But, now I'm thinking I'd rather do an excursion where I can go see turtles. I've only seen one turtle in all my cruises and it wasn't even up close, so I think that's what I'll plan on doing. Who knows, maybe I'll find an excursion where I can see both turtles and stingrays! So far, I haven't made up my mind on excursions for Costa Maya, but I'm almost positive that I'll stay on the ship when we're in Cozumel. I was just there last April and don't see any excursion options online that look too exciting. Most likely I'll be ready for a quiet day after 2 busy port days, so I might just take advantage of a nearly empty ship and relax by the pool. In terms of rooms, I am currently booked in a balcony room. I made the mistake of cruising with a balcony for my very first cruise and I just don't think I'd ever want to go on a cruise without one. Like I've said in previous posts, one of my favorite things is waking up in the morning and having room service breakfast on the balcony. I think those are all the main details of this next cruise. There are just over 14 weeks left as of today, so I'm already counting down the days and looking forward to the trip. Like I said earlier, I'll be doing a tips & tricks blog post sometime soon, so leave a comment if there are any questions you'd like me to answer. I'm definitely not an expert, but I have learned a thing or two over the past 4 years, so hopefully I can be helpful! ​Stay tuned for the trip report once I get back!! Today I'll be showing you the exterior of the model home and then talking about the ideas I have so far on how I want to customize it. This area of the house is the least defined in my head, so I've still got a lot of decisions to make. Let's get started! I've already talked a little bit about how I'd ideally like to have double glass doors for my entry. You can see from the outside that the living room window would definitely need to move over for that to happen. Also, I'm thinking of leaving the center window up top in place but then removing the outer windows. Those windows are currently in the lofts, but if I add skylights to each room then I think I will have plenty of light (and more privacy) without the side windows. 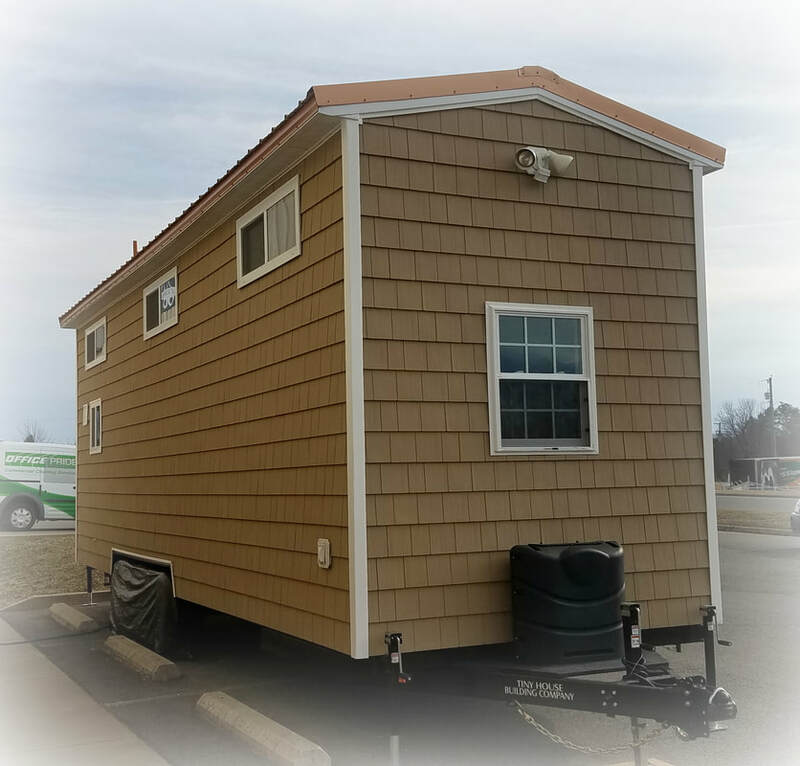 This picture shows the siding better than the first exterior picture. I don't mind the shingle material, but I really don't love the color. I'm thinking I'll switch to a gray color and keep the white trim. You can also see the small side window that goes into the bathroom, which I'll definitely be removing. However, I will keep the kitchen window on the end because I love how it looks both from the inside and the outside. I also think it would be cute to add either shutters or a flower box to add some extra decoration to the outside. It's kind of hard to see, but the model's roof is made out of copper. Generally, I like the look of copper, but I don't think I'd want it as a roof material. Also, like I mentioned in a previous post, I'm planning on having a flat roof, so that will change the aesthetic a little bit too. Even though I'd like to have a rooftop "patio", I don't want to add railings or anything permanent, so it will be more of a rooftop "pad". I'm basically envisioning just a flat surface to put pillows and blankets on when I want to lie down and look at the stars. I don't think I've given the dimensions for my dream tiny home yet. I'm thinking I'll end up going with a 28-foot trailer. The width would probably be about 8.5 feet and the height would be somewhere around 13 feet. It seemed like a good idea to get a realistic view of my future living space, so I measured out the dimensions in my apartment last night. It looks like the main floor will take up about the same amount of space as my current living room and dining room. That doesn't take into account the 2 lofts or the 13-foot ceiling though! All together the house would be just over 400 square feet, which is less than half of what I live in right now. Thankfully, with all the built-ins I won't need to keep hardly any furniture other than my couch and mattress, so that will get rid of the majority of what fills up my current apartment. I've also been slowly weeding out stuff and will continue to do that until I've got a realistic amount of possessions for a tiny home. Now here are some of my ideas for the rest of the exterior once it's placed on the lot it will live on. I'd really like a deck/porch in front of the house. These are both pretty elaborate, but it gives you a basic idea of what I'm thinking of. 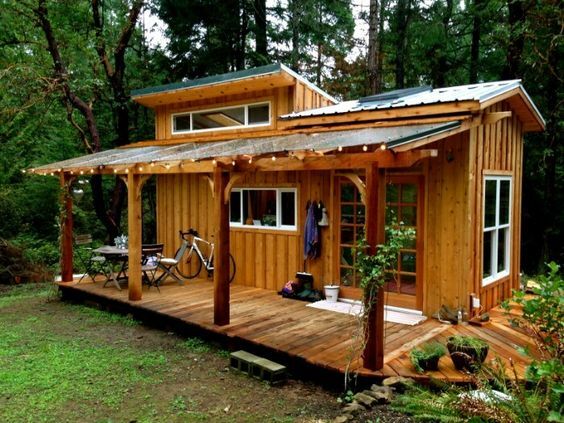 I don't want anything attached to the tiny home, so most likely I wouldn't have a roof over the porch. I'd really just like a nice way to get into the house that's a bit more civilized than some rough plywood steps. 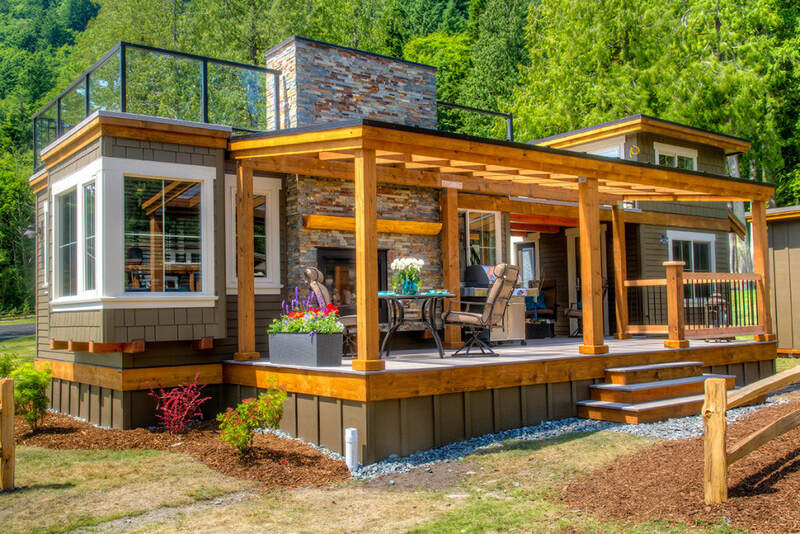 A porch is also a nice way to cover up the trailer wheels and give the house more of a permanent kind of feel to it. I'm also thinking realistically in terms of storage, so I'd need some type of shed where I can keep bigger items like my suitcase and also store sentimental items like the cedar chest and rocking chair my grandpa made by hand. Getting a storage unit for the short-term is definitely an option, so this would be on my to-do list once everything else is settled. The last thing I'd like on the outside of the house is an unattached carport. That would obviously be a wish list item and not a top priority, but it would be nice to finally not have to brush snow off my car every single winter! And that's it! The end. I will try to post an update once I'm able to sit down with a builder and discuss further details. Hopefully nothing major will change in my vision, but you never know. I'm also super tempted to go wander through Home Depot and start picking out faucets and door knobs, but I know that is WAY ahead of schedule. But anyone who knows me can tell you that I'm a details kind of girl, so I guess that's just how I roll! I hope you've enjoyed this blog series! Let me know in the comments what you think of my dream tiny home. 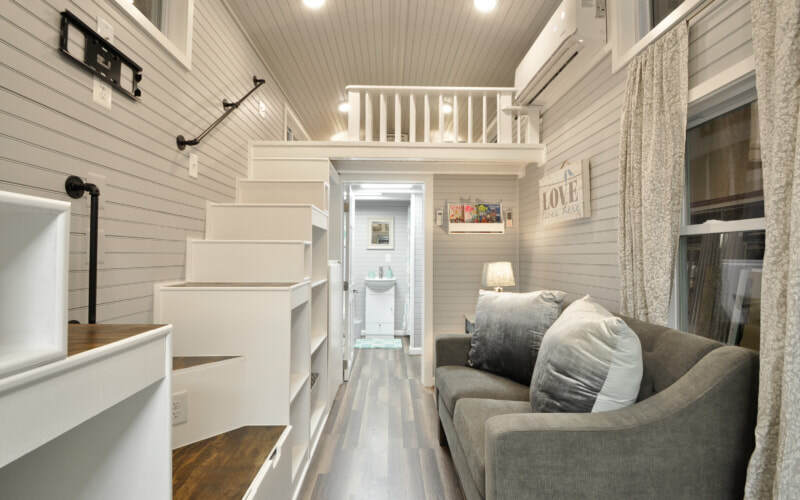 I also want to know: would you ever want to live in a tiny home? This is the third post in a series about designing a dream tiny home. In the first post, I talked about the entry and the kitchen. And then in the second post, I talked about the living room and the bathroom. Check them out if you'd like to see the rest of the house! Today we'll be walking through the two lofts upstairs. The biggest difference in my own design will be that the ceiling won't be quite so pitched. The builder I talked to said that it's completely possible to do a flat roof, which gives you a lot more head space in the lofts. 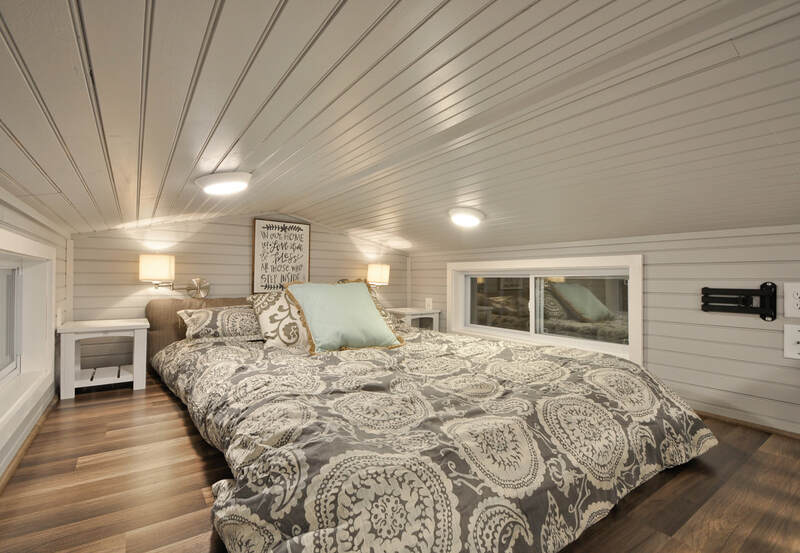 So try to picture more of a traditional ceiling rather than the angled ceiling you see in the pictures. One of the things I like the most about this layout is how much space you get in the lofts. 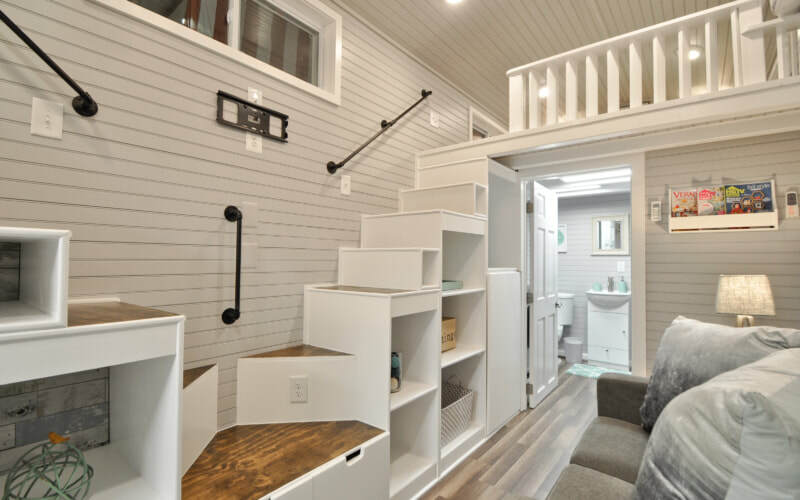 In a lot of tiny homes you barely have room for a bed, let alone room to walk around either side of it! For my bedroom, I decided to use the loft over the bathroom. Even though the walk through the living room wouldn't be that long, it still might be nice for midnight bathroom trips to have them on the same side of the house. In the bedroom I'm thinking of having a custom built-in made along the back wall. I'm picturing it having a headboard with a shelf or two and then a nightstand on either side with a drawer or shelf built into it. I do like the idea of the two lamps that are mounted on the wall, so I might keep that idea. I'm also not sure of the mount for a second TV. I think I'd probably get rid of that. 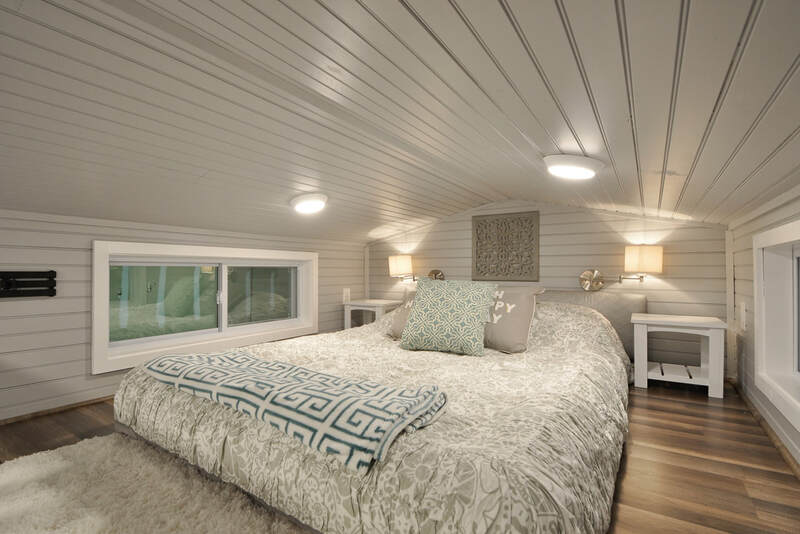 My favorite idea for the whole house is to have a skylight put in over the bed so I can see the stars at night. Doesn't that sound nice? With the extra light coming in from the skylight I could probably get ride of the windows and have extra wall space and more privacy as well. ​Also, with the roof being flat in my design, there's a good chance I could make a patio up on the roof. 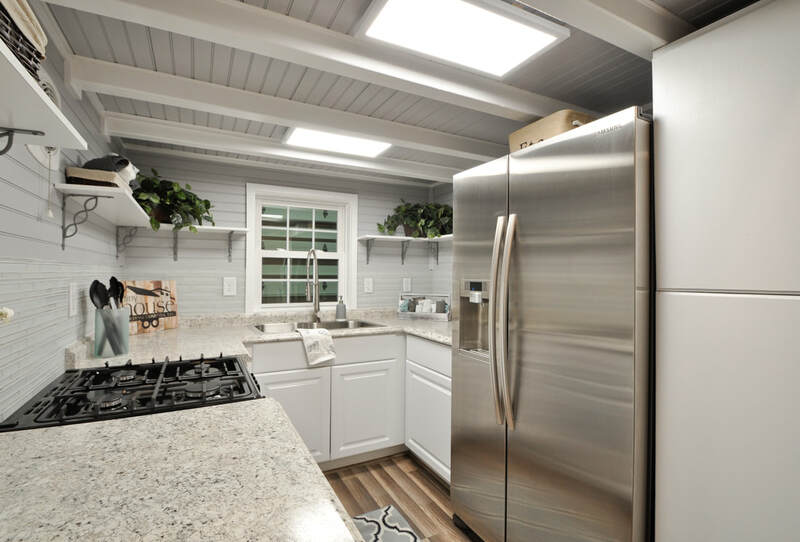 I'm thinking a second skylight could be put in with a ladder so I can use that to climb up on the roof from inside the house. Pretty cool, huh? I know this picture doesn't look like an office or library, but I wanted to show you the space so I can explain my vision. First of all, I'd remove the windows and probably put in a skylight or two. With all the extra wall space, I plan on having custom bookshelves built in along all 3 walls. This will give me plenty of room to store all my books, which is something I won't be downsizing when I move! Since I work from home, I'll also need a desk to work at. I'm thinking in the center of the far wall I'll have a desk built that connects with the bookshelves so it's all one piece. It won't have to be a huge desk, but I do need space for my two work monitors and maybe a drawer for office supplies. And then depending on how much floor space I have after the built-ins are added, I might also add a reading chair near the railing. This will give the loft even more functionality and really add to the library feel I'm going for. 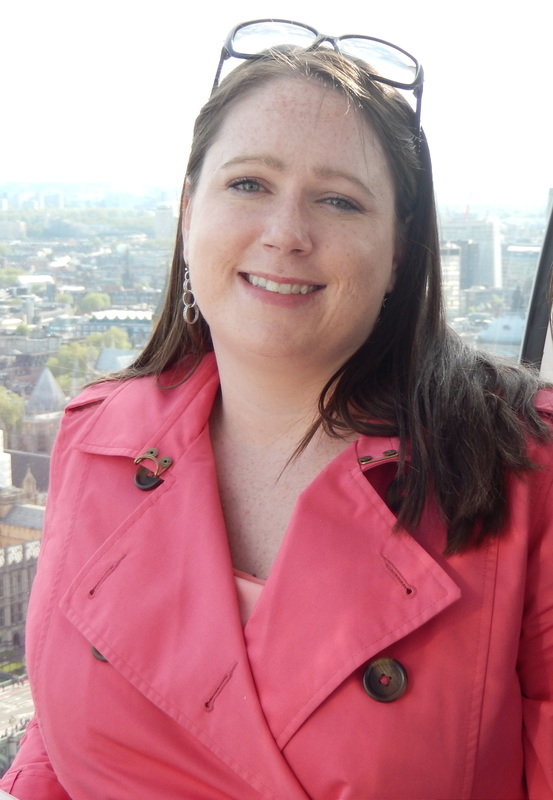 Thank you for staying with me through this blog series! I originally planned on putting everything into one big post, but realized pretty quickly that it would be massive and no one would want to scroll for that long. Let me know in the comments how you're liking it so far and what you think of my design ideas. I'd also love to hear if you have any ideas you'd like to share with me. 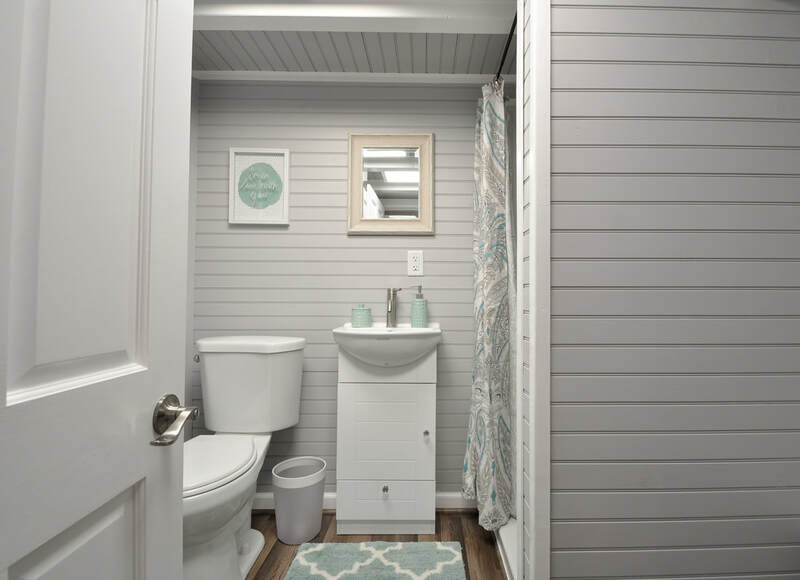 The last post of the series will be about the exterior of the tiny home, including ideas on the rooftop patio I mentioned as well as an unattached porch/deck I'd like to add once the house is placed on the lot. Stay tuned for more! The other day I shared my thoughts around tiny homes and explained that I've been thinking of designing & building my own at some point. 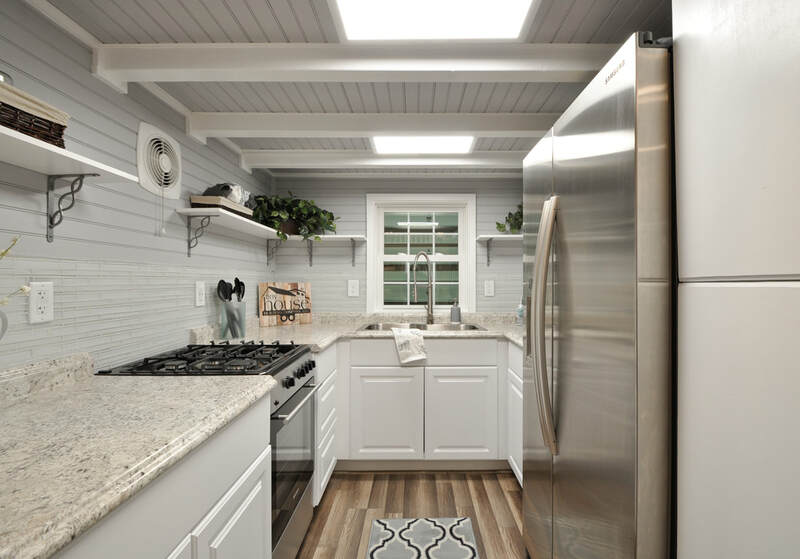 Take a look at my first tiny home post to see the pictures of the entry and kitchen. Today, I'll be walking you through the rest of the first floor, which includes the living room and the bathroom. Let's get started! As you can see, the living room has stairs leading up to both lofts. 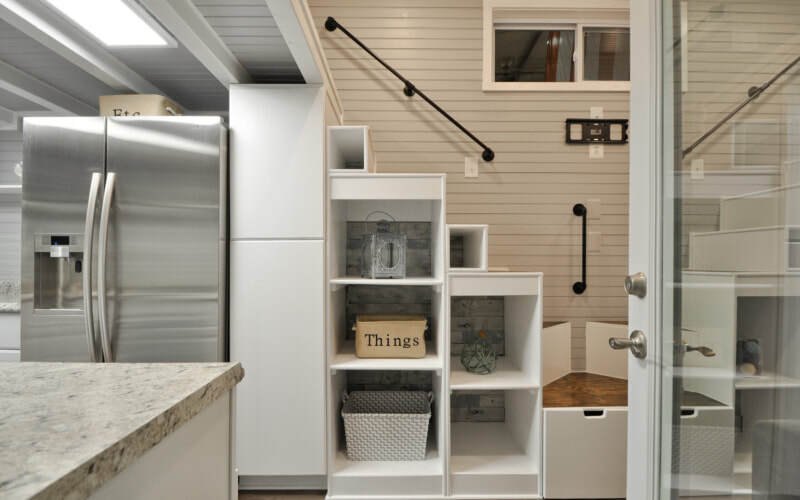 The smart thing is that the space under the stairs is used for storage. Super important in a tiny home, right? There's also a mount for a TV on the wall across from the couch, so that helps save some space as well. Here's a better view of the storage that is closest to the bathroom. One of the big changes I'd make is to move the washer/dryer combo that's currently in the bathroom to under the stairs. It looks like there's already a larger cabinet closest to the bathroom door, so I'd like to have the washer/drying built into that space with some shelves above it for my laundry detergent, etc. I can also see storing my extra bath towels up above the washer/dryer because they'd be nice and close to the bathroom. For the rest of the storage I'd probably use that for all my movies, unless I decide to put the discs in one big binder. The other change I'd like to make to this setup is the lower stairs. I'm not a fan of the triangle shaped steps, so I'd rather have that be a half step that goes all the way across. It could also serve as a spot to sit if I had company. The drawers under the bottom step would be where I keep throw blankets or an extra pillow or two. From this view you can see that there is a fairly small couch in the living room. I'd get rid of the table & lamp on the end to make room for a longer couch. I might also move the window over a bit to center it on that wall. Ideally, I'd love to have double glass doors for the entry, but I'm not sure if I'll have enough wall space for that. If you look high up over the couch, you can see the heating & cooling unit. This will provide both heat in the winter as well as air conditioning in the summer. The light at the very top is also a ceiling fan, which I absolutely love the idea of! The bathroom is actually a really nice size! Behind the door is the washer/dryer combo that I plan on putting under the stairs. Off to the right is the shower and the closet. I'm thinking of making some big changes in the bathroom, especially in this area. The first change I'd make would be to either take out the window or make it frosted. It's directly across from the shower, so I'm not sure why the builder thought it would be a good idea to put it there! Also, I think I'd like to swap the toilet and the sink so that the toilet is in the middle of the wall. With the washer/dryer being outside the bathroom under the stairs, this would leave a whole wall open for a sink area. I'd like to have a counter running the entire way across that wall with a mirror over it. On one side I'd have the sink with open space underneath for the cat litter boxes. On the other side I'd probably have drawers or cupboards built in for storage. I can also see setting up a makeup/vanity area at one end, maybe even with a stool for sitting down to do my makeup. It would also be nice to have a medicine cabinet on one of the side walls. On the other side of the bathroom is the shower and the closet area. My first change would be to put in a glass door of some kind instead of a shower curtain. For the closet area, I'd probably take out the bench and put in a second bar halfway down to maximize hanging space. Although, if you read my capsule wardrobe blog post you'll know that I've significantly reduced my wardrobe, so maybe I won't need a second hanging bar. I'd also add a shelf near the top for extra storage, either for shoes or purses. The biggest change I'd like to make in this area is to add in a barn door that slides to close off the closet. With the limited space, a normal door wouldn't really work, but a sliding barn door would look kind of cool. I know it would cover the shower when the closet is open, but I don't see that being a problem since I live by myself. I can't be in the shower and the closet at the same time anyway! That's it for today! In a few days I'll write another post about the two lofts. One will be my bedroom and the other I'm going to make into my office/library. 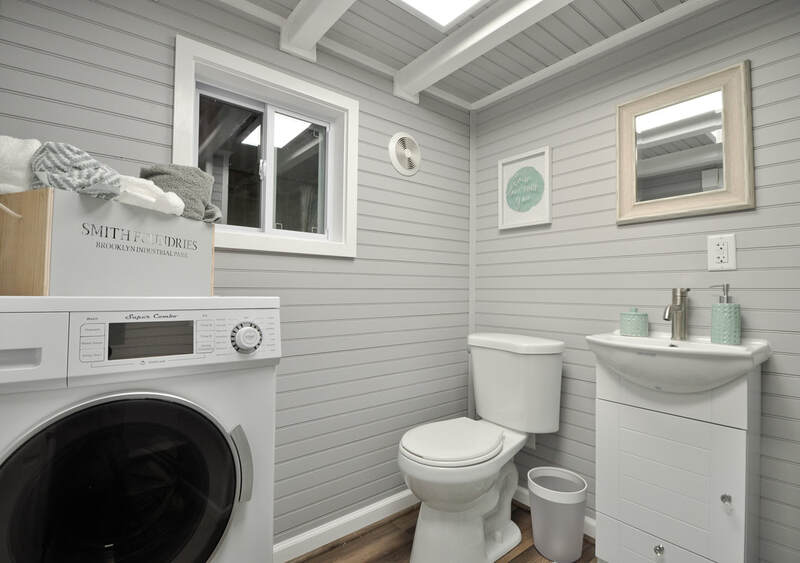 Isn't it crazy how much you can fit into such a small space if you design it efficiently? ​As always, I'd love to hear from you! 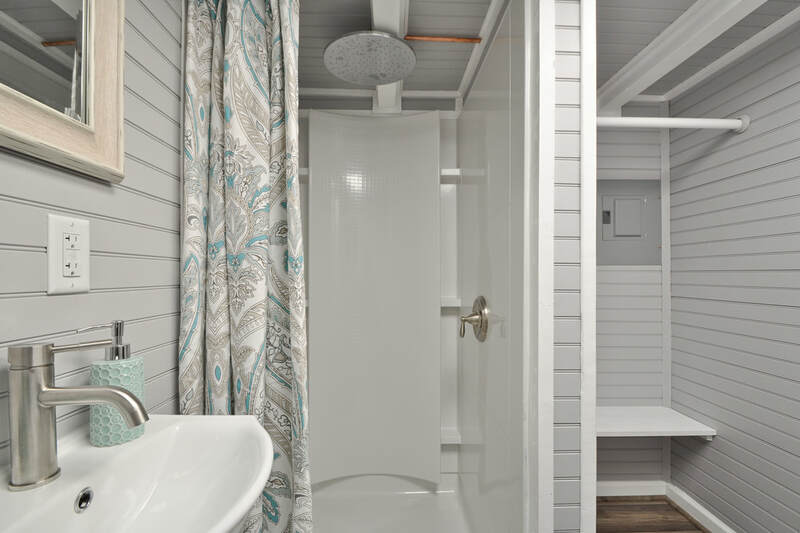 Leave a comment if you've had your own experience designing a house or if you are dreaming of living in a tiny home. Tiny homes are getting more and more popular every day. It seems like they are being talked about all over the country. There's a documentary on Netflix and even a Tiny House Hunter's show on HGTV. I've always been fascinated by tiny homes. I would personally love an excuse to get rid of half my belongings. Thinking about minimalism and simplicity has gotten me dreaming about designing and buying my own tiny home. I currently live in an apartment, so my monthly rent isn't going towards any type of investment. Wouldn't it be better to spend that money (or even less) on something tangible that I can sell later if I want or need to? Yesterday I went to a tiny home Christmas village where they let you take tours of about 6-8 tiny homes from different local builders. 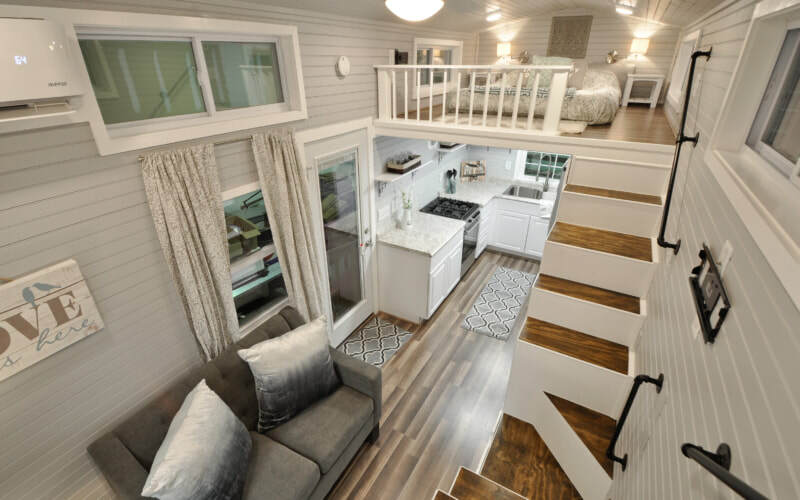 It was my first time being inside a tiny home and it was really cool to see all the ideas and options that are available. I also went to a Meetup with the Denver Metro Tiny House Enthusiasts group. I met lots of nice people and learned a ton of information. One of the people I met was Ryan, who runs the Tiny Home Connection, where you can build and store your tiny house if you are a DIY-er or you can have them build the whole thing for you. And before you think I'm starting to go all hippie, I don't plan on having an outhouse or trying to live off grid. I fully plan on having all the luxuries of a modern house, including a washer/dryer and a flushing toilet! 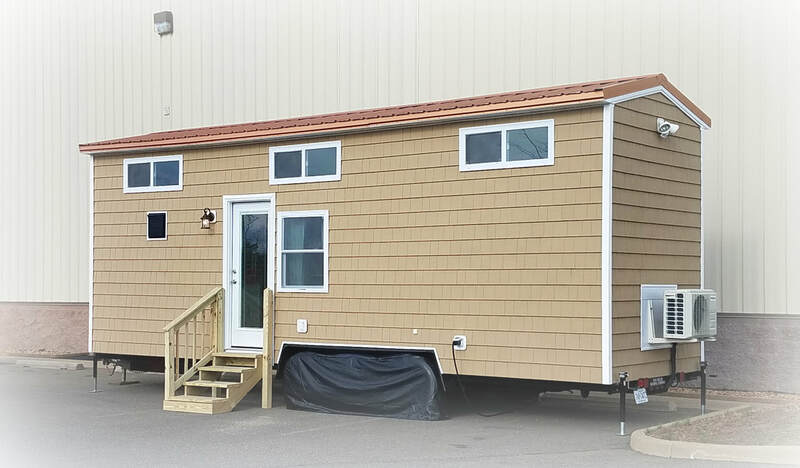 I already found a tiny home model that I love, but it's from a builder in Virginia. My plan is to find a local builder in Colorado and work with them to customize the floorplan I found so I can make it my own style. 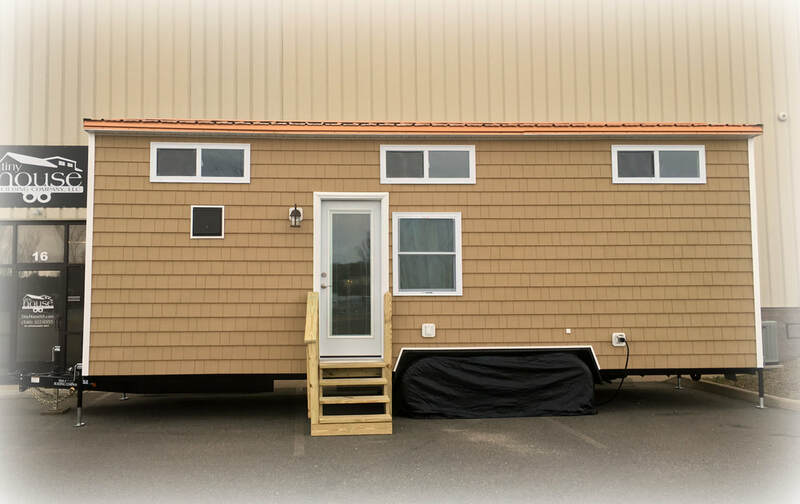 I'm going to show you pictures of the model, which is called The Kate from Tiny House Building Company. Then I'll walk you through some of the changes I plan on making for my own design. There are lots of pictures, so I'll be breaking this up into a few different posts that I'll share over the next week or so. 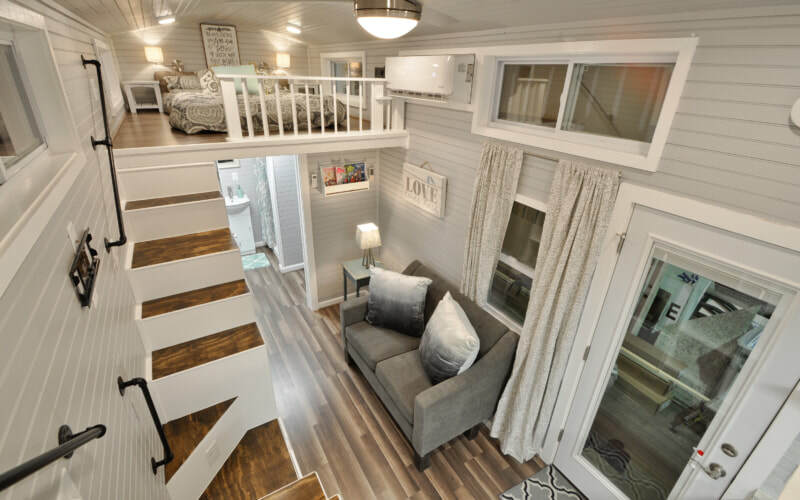 When you first walk into the tiny house, you see the stairs leading up to one of the lofts. The kitchen is off to the left with a pantry next to the fridge. The living room is on the right. One of the only changes I would like to make to the entry is to turn the cubby spot with 3 shelves into more of a coat nook. I'd take the shelves out and add coat hooks on the back to make it a nice place to hang up jackets. I'd probably use the 2 shelves next to it for shoes, so maybe I'd make those shorter so I could fit 3 or more shelves in there. I'm also not a fan of the material on the back of the storage area, so I'd pick something else. See what I mean about the luxuries of a modern home? This is a full-size kitchen that might actually be bigger than the one in my current apartment! My first change to the kitchen would actually be picking out a smaller fridge. I don't need one quite that big and that extra space would let me make the pantry on the right even larger. I'd keep the cabinets the way they are, but I'd like to add a dishwasher somewhere, possibly under the counter in the foreground of the picture. I really like the window over the sink and I absolutely love the sink & faucet, so I'll be keeping those. I'm planning on putting a microwave on the counter to the right, which will kind of tuck it away off to the side of the fridge. 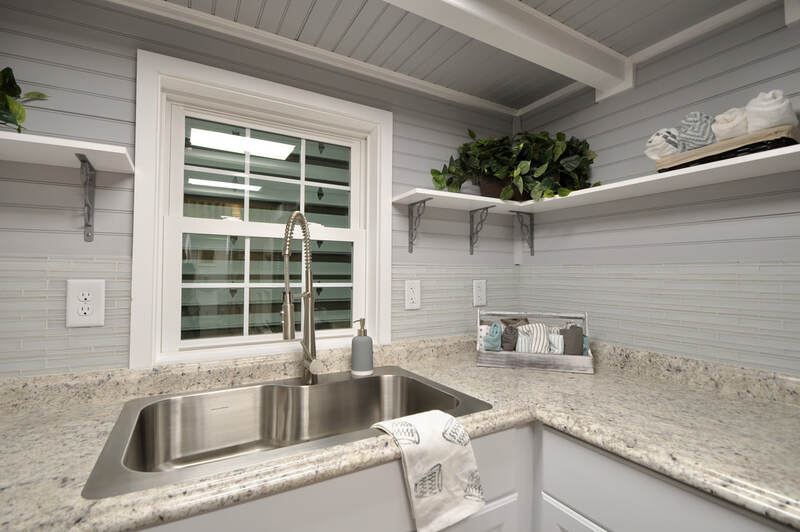 I plan to keep the open shelves, but I'd like to have 2 sets of shelves on each wall and then remove the two shelves closest to the window over the sink. I'd use that open wall space for my hanging spice rack and probably one of those magnetic strips that's meant to store knives. On the counter next to the stove, closest to the camera, I plan on making a drink station. This is where I'd put my Keurig and some type of storage for all my tea. I'd also like to find a cute way to display coffee mugs. I've seen a few ideas on Pinterest, so maybe I'll find a nice "Coffee" sign to hang on the wall and then hang the mugs from hooks underneath. I also think it's really hard to see the glass tile backsplash because it blends in so much. I'm hoping to do something that will stand out a little more. So that it's for today! There's a whole lot more to share though, so I'll be posting more about all the other rooms in the next few days. In the meanwhile, let me know in the comments if you are a fan of tiny homes and if you think you could ever live in one. You might be wondering what had me feeling so frantic. Was I in a dangerous situation? Was I counting down to a disaster? I'm anxiously waiting to buy my ticket for Taylor Swift's next concert. Maybe it seems like an over-exagerration, but in that moment I felt extremely nervous and excited. Part of my excitement was because of the 3 months of hard work and preparation that lead up to this moment. Back in August, Taylor Swift announced that she had a new album coming out on November 10. It was also announced that in order to qualify for her concert pre-sale, you would have the chance earn boosts through the Ticketmaster Verified Fan program. You were given the chance to watch videos and buy albums or merchandise to earn as many boosts as possible. Basically, the more time and energy you put in ahead of time, the further up you'd be in line once her concert tickets went on sale. Personally, I liked the idea of this because it made the whole situation feel like I would have some control over my place in line. The main investment I made in the Verified Fan program was my time. I knew I wanted a good seat for the concert, so I made it a point to watch as many videos per day as I could. By the end of the 3 months, I had 2400 boosts! Thankfully, I figured out early on that I could plug in my headphones but not put them in my ears, so I didn't have to listen to the songs hundreds of times over and over. Don't get me wrong, I like her music, but not THAT much. I was also able to play the videos on my iPad, which I would set up next to my work computer. All I had to do at that point was press play. Once the boosts were completed, each person was sent a time slot when they would receive their code to go on the website and buy their tickets. Based on my boosts, I ended up being in front of 99% of the people who wanted tickets in Denver. When they sent me my time slot, I ended up being in the very first group to buy tickets. So, of the 75,000+ people who will fit into the stadium for her concert, I literally had my pick of every seat. This takes me to the moment I described at the beginning of this post, where my heart is pounding and my palms are sweating. I knew my code would show up at any moment, but I didn't know how many other people would be buying tickets at the same time as me. I also didn't know how much VIP tickets would cost, so I was nervous that they would be way outside my budget. It ended up that my nervousness was justified, because the front row ticket I had been hoping for ended up costing $1,500. Needless to say, I wasn't prepared to spend THAT much money on a 2-hour show, so I went to Plan B. I knew a lot of other fans were hoping to get a spot in the center pit, which is right in front of the stage. I wasn't completely sure that I would want to be standing in a big crowd for the whole show, even if it was an amazing experience. But because of the high price for floor tickets, I did end up getting a spot in the center pit. Even that was still more than I had expected to spend, but I knew that I wanted an incredible experience and it literally doesn't get any better than that section. Here's a look at the stadium seating. 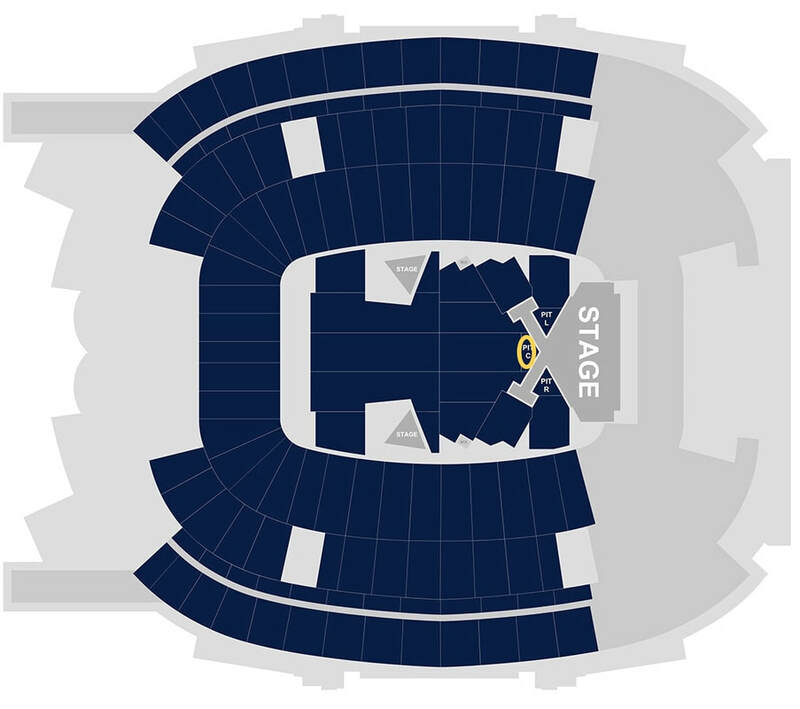 I'll be in the yellow circle right in front of the stage. Crazy, right? So, that's my whole experience with getting my ticket to Taylor Swift's stadium tour!! I'm already counting down the days until May 25 and I'm excited that I only have to wait a few months. I'll be sure to write another post after the concert to share how it goes. Let me know in the comments if you're also going to the concert and which city you'll be going in. Keep reading for a quick summary of why I want to read each book and a link to all the books on Amazon. Practical Magic is still one of my favorite movies from when I was younger and surprisingly I never got around to reading the book. Alice Hoffman recently released a prequel to this novel called The Rules of Magic, so I figured now would be a good time to read both books. I've already finished the first book and I did like it even though it was different than I expected. There were a few big differences from the movie, but overall it was an enjoyable book to read and I am looking forward to reading the next one. The Alchemist is a book I've heard about from time to time over the years, but I never really knew what it was about. It's come to my attention more and more over the last year, so I decided it's about time I get around to reading it. Other than knowing it's about the quest of a young shepard boy, I don't know much else about it. Based on the positive reviews and recommendations I've seen over the years, I am excited to check it out for myself. ​The White Queen is one of Philippa Gregory's historical fiction novels that I haven't read yet. The book has been made into a TV series on Starz that I've been meaning to watch, but I decided that I would try and read the book first. I've loved every other book that I've read by Philippa Gregory, so I've got high hopes for this one! ​Origin is Dan Brown's latest novel and I knew it would be on my reading list as soon as it came out. All of his books have been really good so it didn't even matter to me what it was about. I'll only start this one when I'm ready to get sucked into the story and not re-emerge until I've read the whole thing. A Wrinkle In Time is the only book on this list that I have already read before. I read it at some point a long time ago and I barely remember anything about it. When I heard that they are making a movie from the book I knew I needed to re-read it! I just saw the movie trailer over the weekend and it looks like it's going to be good. I've already started this book and only have a few more days before I have to return it to the library. Thankfully, it's a relatively short book, so I'm sure I can sprint through the rest fairly quickly. ​Letters to the Lost is a recent addition to my to-read list. I saw it in one of the reading lists I found on Pinterest recently and I liked how it sounded. It's a Young Adult novel and also a romance, which are two of my favorite genres, so I'm excited to see how well the author tells the story. ​Moxie is another YA book on my list that I'm excited to read. This is also another author I've never read before. It sounds like the book is highly relevant to today's issues and topics, mostly because it tells the story of a teenage girl who starts a feminist revolution in her Texas high school. I'm hoping the story is as interesting as it sounds! ​Ringer is the second book in the Replica series. I read the first book a few months ago and really loved the concept, so I was excited to see that the next book was scheduled to come out in October. Just like the first book, this one is split into two separate stories from two different characters. The book is literally split into two pieces, so you can read one story and then flip the book over and read the other one. The jacket says you can either read the chapters in both books by alternating between the two or you can also read one whole side and then the other. I read this book in only 3 or 4 sittings, so it is definitely a quick read and a good story to get sucked into! 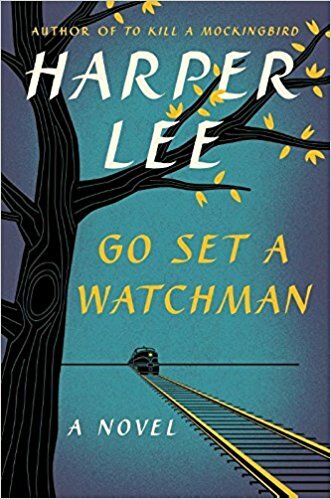 ​Go Set a Watchman is Harper Lee's sequel to the well-known To Kill A Mockingbird. I bought both of them as audio books a while ago. The first book is narrated by Sissy Spacek and this one is narrated by Reese Witherspoon. Like most people, I read To Kill A Mockingbird back in school, but I wanted to re-read it as an adult. Now that I've listened to the audio book and reacquainted myself with the characters, I'm looking forward to seeing what happens to them twenty years later in this book. And that's the end! Those are the 10 books that I have read or plan on reading for this fall and winter. Let me know in the comments if you've read any of these books or if you have your own reading list that you are working on! My name is Beth and I live in Denver. I am a single lady in my 30's and wanted to start sharing my awesome and amazing life through a blog. ​Follow me as I navigate life, work towards being happier, and also focus on learning to love my life and myself.